Other pundits and pontificators have their wish list about what President Trump should say in his State of the Union Address tonight. As your humble Asian American amok scribe, I have a simple list of my own, which includes the same things everyone else wants to hear. The truth would be a good start, though I’ll settle for him sticking to the teleprompter. But I bet I’m the only one who hopes Trump mentions the names Fufai Pun, Kheong Ng-Thang, and Tsz Mat Pun. You’re Asian American and you don’t know them? That’s the shame. All of America should know what happened to the Seaport Three. Everyone who cares about Vincent Chin should know Fufai Pun, Kheong Ng-Thang, and Tsz Mat Pun. 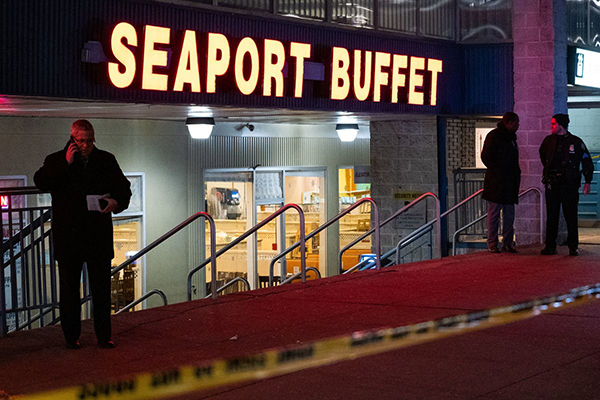 The three men, Asian immigrants all, are dead, murdered in a violent hate crime that took place Jan. 15 in the Sheepshead Bay section of Brooklyn. They worked at the Seaport Buffet. Fufai Pun, 34, was the chef. Ng-Thang, 60, was the owner. Tsz Mat Pun, 50, was the manager. The Brooklyn DA’s office alleges they were literally hammered to death by Arthur Martunovich, a 34-year-old Estonian immigrant. Martunovich essentially saw himself as some kind of twisted social justice warrior. He’s in custody tonight as an alleged hate crime murderer. But it’s the hate crime massacre no one knows about. And it happened in Brooklyn. Not far from Queens, where Trump grew up, or Manhattan, where his brands live. A triple murder with a hammer in the biggest city in the nation and no one knows about it? Too local? Or too Asian? Fufai Pun, Kheong Ng-Thang, and Tsz Mat Pun are real life Asian American immigrants in our country. Like my cousin David, whom I wrote about in a previous column, from all appearances they were honest hard-working folk. Not the good stereotype of “Crazy Rich Asians.” And not the bad stereotype of immigrants—the troublemakers, gang members, human traffickers. The ones Trump draws on to energize his own political life based on fear. No, the Seaport Three were ordinary people living their American dream. These were restaurant workers. The entrepreneurial poor. Working hard enough, but not rich enough to be on Trump’s radar as a protected class, let alone acknowledged. What happened to them is as evil as any crime Trump claims occurred on the southern border. Of course, the most heinous of crimes are the ones perpetrated by the government in the separation of children from their migrant parents. But this is the southern part of Brooklyn. And that’s not a concern of Trump. Nor are Asian Americans. Fufai Pun, Kheong Ng-Thang, and Tsz Mat Pun. I’d like to hear Trump mention them and talk about how we should fear immigrant perps like the Estonian Arthur Martunovich. Are we going to ban white immigrants? Or just ignore their crimes? A mere mention could be a unifying thing. In his 2017 speech before a joint session of Congress, Trump obliquely mentioned the death of Srinivas Kuchibhotla, so it’s not so far-fetched. Trump could mention Fufai Pun, Kheong Ng-Thang, and Tsz Mat Pun. Even invite the grieving families to the gallery. The Trump instinct might be to turn them into the Asian Central Park Five. Only these Asians weren’t the preps. They’re the murdered innocents who can’t help Trump. It’s a powerful story that destroys Trump’s simplistic and racist border wall narrative. No wall would have helped in Sheepshead Bay. So we won’t hear about it in the State of the Union address. Brace yourselves for more xenophobic tales of duct-taped women and bad hombres from across the southern border. And nothing about Fufai Pun, Kheong Ng-Thang, and Tsz Mat Pun, the Asian American innocents in the south of Brooklyn, massacred by a white European immigrant, Arthur Martunovich. And if you can’t make it to SF, bring me to your school, town, community group this year.